Did you think your grades were enough to put university and the world at your feet? Did you think that your future happiness was guaranteed? See how you fare on the Entrance exam below. Note: candidates should attempt all ten questions. What will my university do for me? And what will it not do? Where should I look for wisdom at university, where should I seek for those guiding principles that instruct on the art of living virtuously and happily? What is uppermost in my mind: the usefulness of the qualification I gain for my career path, or the sort of person I aspire to become by the end of my course? If the latter, what steps should I take to enable this transformation to take place? Will I grow up at university, if by ‘growing up’ is meant, not just being able to look after no. 1, but being able to look after others? Or is my guiding aim for uni’ simply ‘having a good time’? Do I feel uncomfortable with my life-principles and my faith, in living them out without the immediate support of my family or school, and in having to explain ‘the hope that lies within me’? Am I prepared to stand out from the crowd? Does ‘daring to be different’ fill me with dread, or does the challenge inspire me with a sense of adventure? Am I over-concerned about my health and diet? Am I engrossed with the well-being of my body, but not my mind, heart and soul? With polluting my body, and not with polluting my mind and my heart? Does my altruism only extend to the recycling of plastic bags and the occasional donation to a good cause, or am I prepared to give abundantly of my time? St John Paul II’s law of the gift states that ‘man does not find himself without a sincere gift of self’. On that score, am I preparing for a lifetime of self-discovery and self-donation? Where do I want to be in ten years’ time? In twenty? In forty? With a family and children? In an interesting and well-remunerated job? Having close friends who are loyal and supportive? What steps do I need to take now so as to develop my talents and establish a habit of virtuous behaviour that will enable me to achieve these goals? In asking such questions, a student must surely realise that he or she is not the first to ponder these matters and that there is a long tradition of those who have thought deeply about them. Even to ask these questions entails assumptions about human nature – that we are responsible for the development of our own character – and a realisation that it is by means of cultivating human virtues that ideals and ambitions are achieved. By contrast, those who simply look forward to throwing off the ‘shackles’ of home and school and to three or four years of pleasure-seeking are squandering their opportunities for personal enrichment in that crucial period of preparation for adulthood and its accompanying responsibilities. 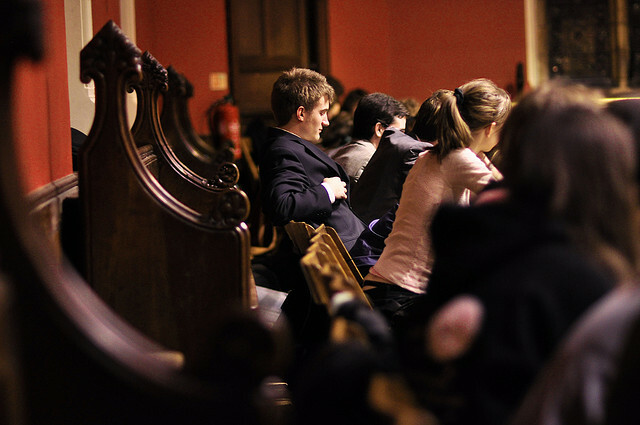 In the transitional state of student existence, with its intoxicating mixture of newly-gained independence and relative absence of responsibility, the ordinary undergraduate will at some point reflect on and acquire guiding principles for life, a process which might entail consciously accepting or rejecting the guiding principles of his or her earlier formative years – or even coming to a judgement on the fact that they did not receive any guiding principles. The two approaches are not incompatible because, as Newman says, education is to fit us for this world, while preparing us for the next. Newman says that a university is ‘a place of teaching universal knowledge’. This implies that its principal object is in the first place intellectual, not moral, and in the second that it entails the diffusion of knowledge rather than its advancement (i.e. research). It is neither a seminary or centre of religious training, as this would hardly make it a ‘seat of literature and science’; nor is it a research institute, because otherwise it need not have students. In pondering over what is required for the university to flourish, Newman made his own original contribution to the question by employing the Aristotelian distinction between the essence of something and its integrity. The essence of an object refers to what is necessary for its nature, whereas its integrity (eudemonia) refers to what is required for its harmonious functioning or well-being; it is a gift added to its nature. Without it that nature is indeed complete, and can act and fulfill its end, though not with ease. A further qualification follows, as Newman explains that this ecclesial assistance or incorporation does not imply that the university’s main characteristics are changed; the university retains the office of intellectual education, but now aided in the performance of that office by the steadying hand of the Church. These words will help to guide those with responsibility for higher education as the balance between education online and on-campus is tested. Newman even suggested that ‘the Houses of Parliament and the atmosphere around them are a sort of University of politics’. Newman once referred to his three and a half years at Trinity College Oxford as, ‘the dangerous season of my Undergraduate residence’. Today, the wisdom of generations and the experience of life seem to have been set aside. For centuries that part of the life-cycle between childhood and adulthood (from approximately fifteen to twenty-five) has traditionally been designated as the third of the seven ages of man, and the one which parents and educators regarded as the most dangerous. Today’s world is blasé to the point of being irresponsible about the ‘third age’, and yet in some respects the predicament of today’s students is more precarious than it ever was: most live away from home and inhabit an artificial world of opportunities and attractions, with few demands on them other than the academic, and belong to a society where there are rights aplenty, but few duties. For an age which supposedly worships authenticity, there is a surprising amount of (unconscious) compliance with the dictates of the prevailing culture; and since the prevailing moral norms are minimal, there are few limits to self-indulgence other than the regard of one’s friends and the size of one’s bank overdraft. Did you know that … a minor social revolution occurred in Britain in 1969, accelerating a process which had been going on for decades? In Newman’s time it was taken for granted that universities acted in loco parentis, but once the age of majority was lowered from twenty-one to eighteen, this ceased to be the case. In 1848 an Oxford don published his Ten letters introductory to college residence. 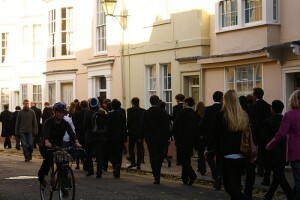 They were intended to smooth the transition from home to school and to alert young men to the fact that they would soon be exposed to the dangers and excesses of student life where many of the constraints of responsibility were absent and the prevailing atmosphere beyond the influence not just of parents, but of the college authorities. These letters express ideas that are remarkably similar to Newman’s – which is no surprise, since the two were Fellows of Oriel College and close friends – and they address the concerns of anxious parents as well as school-leavers. In his two introductory letters, Charles Daman points out to the prospective student that he stood ‘at the very threshold of this definite and critical period’ of life when he was beginning ‘comparative Manhood’, with its measure of independence and freedom and its proportionately increased responsibility. The virtues and habits developed in boyhood now had to be built upon, for, Daman told his reader, you are only ‘conventionally by courtesy a Man, that is a youth, adolescens, an inchoate and promissory man’. In his letters the tutor hoped to assist the aspiring undergraduate ‘to carry to the utmost your notion, to guide you to the lasting and solid realisation of your wish to be a man’. Daman was a committed Christian and in daily contact with Newman. His Ten letters were spiritual in tone, encouraging the reader to lead a life of piety and to consider everything sub specie aeternitatis, and, much as Newman did, he managed to combine high principle with sound, practical advice. Daman encouraged his reader to consider what it means to be a man, first by dealing with the thinking person, then with the social person, and finally with the ruling or governing person. To become a master of others, the student needed to develop his own higher faculties and become master of himself, which he would do by ordering his time, amusements, reading and companions, to the extent that they were not determined by his college. In his letters, Daman urged that his reader’s life should not be merely one of study, but should have the character of devotion too; he gave advice on self-government through keeping to a timetable which would ‘form the character’; he counselled him about the companions he should keep; he cautioned him not to single himself out, but to try to accommodate his high principles with his circumstances; and he encouraged him to prepare for university academically by striving for quality rather than quantity of work and by using his vacations well. The North American novelist Tom Wolfe has ridiculed the superficiality of East Coast society in the United States and its obsession with getting its offspring into Ivy League universities without for a moment reflecting on what those universities might do to their sons and daughters. A similar obsession about ‘getting in’ exists in Britain, where the equivalent ‘promised land’ is Oxbridge (or, to a lesser extent, the Russell Group universities). ‘I have never met a single parent – not one – who has ever shown the slightest curiosity about what happens to them once they get here or what they may have become by the time they graduate’, he recalls telling a group of seniors at Harvard, shortly after the publication of The bonfire of vanities in 1987. Wolfe had illustrated the effects of the malaise at universities in his novel I am Charlotte Simmonds (2004) which paints a depressing picture of a student’s depraved and aimless life at an (imaginary) elite North American university. The prevailing aspiration at most universities is to have a ‘good time’ and do just enough work to see themselves into a well-remunerated career. Without the countercultural support provided by family and friends, the typical university student satirised by Wolfe is likely to graduate emotionally scarred and ill-prepared to form a strong marriage, bring up children or offer selfless service to country and society. University and degree subject league tables are compiled by processing data about the measurable, but the very act of doing so neglects what is not measurable – and which very often lies at the heart of education. Surveys about ‘student satisfaction’ are a crude and unsuccessful attempt to plug this gap. In Education’s end: why our colleges and universities have given up on the meaning of life (2008), Anthony Kronman, a professor and former dean of Yale Law School, contends that questions about the meaning of life which were once studied through the Western tradition have been losing their status as a subject of organised academic study and are now pushed to the margins of professional respectability in the humanities. Questions that the humanities once addressed in a public and organised fashion have now been privatised and the authority to address them, he contends, is monopolised by the churches. Like many others, Kronman places the blame on the modern research ideal and on political correctness. Often resorting to apocalyptic language to make their case, academics like Kronman, though they have no sympathy for the role theology once played, have argued that the university has lost its soul. In other words, an undergraduate education should be regarded as an end in itself; it is about the ‘making of men’. Newman saw the beginning of post-Enlightenment times, when rationalist ideas were already working their way into society and the university; and it is remarkable how observant he was about contemporary trends and how accurate in his diagnosis of educational policies which distorted the true nature of education. In order to address its shortcomings, Newman sought to get to the root of secularism and understand it, and to discern its manifestations. He identifies the chief dangers of the professorial system which neglects the pastoral or collegiate dimension of education – the system which predominates in the West today – when he asserts, ‘These may be called the three vital principles of the Christian student, faith, chastity, love; because their contraries, viz., unbelief or heresy, impurity, and enmity, are just the three great sins against God, ourselves, and our neighbour, which are the death of the soul.’ (Rise and progress of universities) It is easy to see the results in today’s students: religious infidelity and indifferentism, sexual licence of every kind, and an unpleasantly narcissistic individualism.